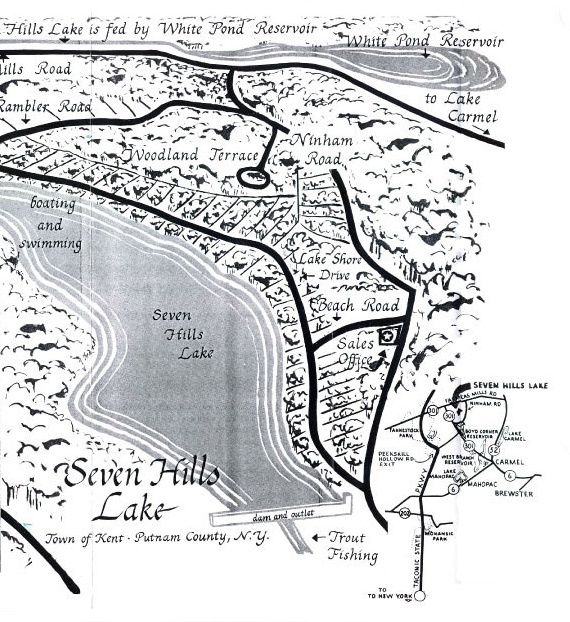 We are constantly on the prowl for sources of old maps and bits of history, especially as it relates directly to Seven Hills Lake. 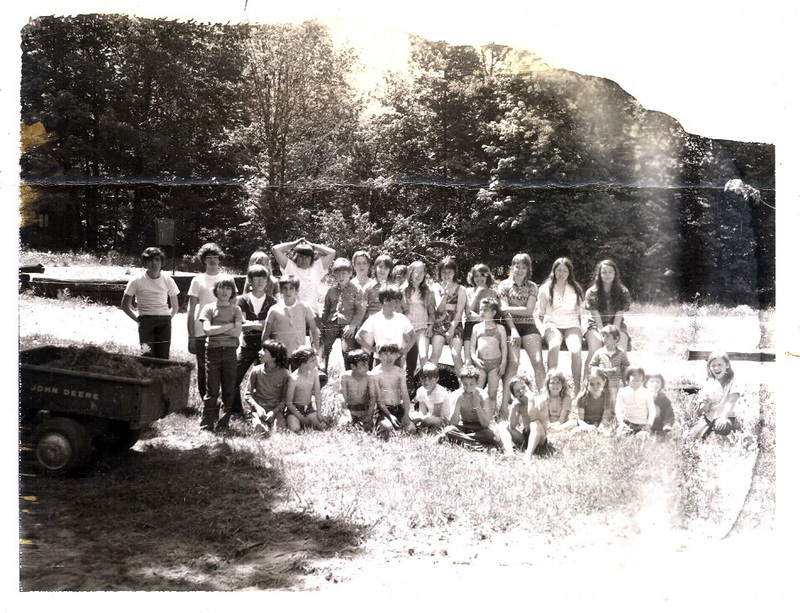 If you or members of your family are in possession of photos, documents, maps or anything else that you feel may be significant in documenting or verifying the history of Seven Hills Lake, please notify our webmaster via email. We would be glad to take a look at what you have uncovered and, if we can get proper clearances, we do have the ability to scan it and put it up here for the education of our members. This site can only be as good as its content and we would appreciate it if everyone would consider sharing what might be in their archives. The name Kent Lakes comes from the Post Office designation. 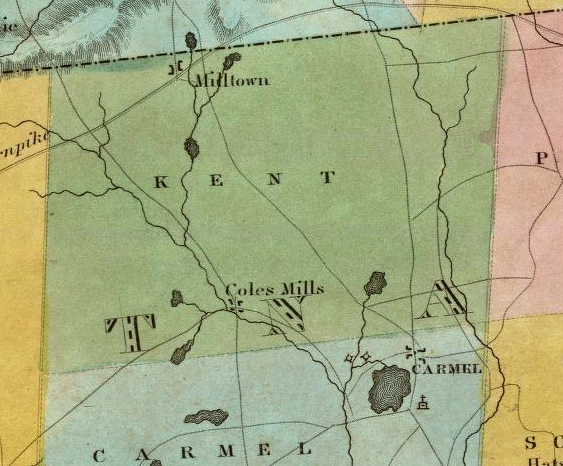 Kent never got its own Post Office designation as it was always attached to the Carmel Post Office. After years of petitioning the Federal government, they decided they would not give us an operating post office, but would give us a mailing designation "Kent Lakes". There is another Kent, New York upstate that has a Kent Post Office and that is why we had to find a variation. A very special thanks goes out to Jerry and Kathy Locasio for providing photographs of this hand-painted collage of Seven Hills Lake, which appears to be titled the "Harry A. Chandler Map." This unique piece resides in the Locasio basement on Seven Hills Lake Drive. It looks as though the artist had taken his cue from some type of promotional brochere and painted around numerous photographs, providing his intrepretation on a much larger scale. The first photo is of the entire map and there are three close-up views for three of the sections below it. Next is a rare photograph from the Locasio archives of Beach Clean-Up day in March of 1972. Then, we have cleaned up an original Seven Hills Lake sales brochere from the late 1950's below. Here is a map of Putnam County from 1868. A close up of the Farmer's Mill area reveals what a bustling community it was in 1868. Many thanks to the David Rumsey Collection. Kent Lakes is located in north-central Putnam County, just south of Dutchess County, bordered on the east by Patterson, on the south by Carmel and on the west by Putnam Valley and Philipstown. It's comprised of about 23,000 acres, it is 15 miles wide from east to west and 6 miles from north to south. We're a small county, yet we're amongst the fastest growing and our per capita wealth surpasses most of New York's other counties. We are home to a number of quite beautiful lakes which were once the domain of summer visitors but now have become year-round communities. 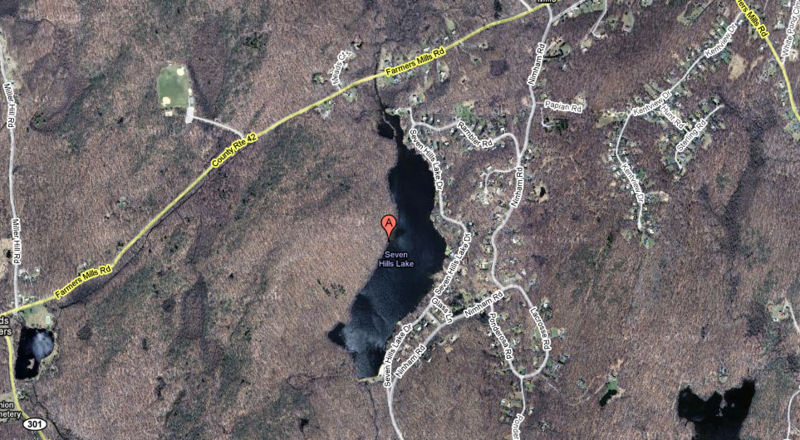 Seven Hills Lake, Sagamore Lake, Lake Tibet, China Lake, Palmer Lake and White Pond are just a few of our many lakes. All our lakes are powerboat free which increases our quality of life and enables more residents to enjoy their beauty. It was originally a part of Frederickstown, which was established March 7th, 1788, and was separated from it and made a new town, under the name of Fredericks in 1795. Its name was changed to Kent in honor of the Kent family in 1817. Kent Lakes is primarily a rural region with many beautiful lakes, ponds, reservoirs and rocky mountain ranges. Because of its proximity to New York City many residents began to travel to Kent to enjoy the beautiful lakes, mountains and quiet green country side. Kent transformed from a rural farming region to suburbia with the construction of Interstate 84 in the 1960's. There are two exits off of Interstate 84, Exit 17 and 18. The Taconic State Parkway on the western side of Kent exits at Route 301 and Hortontown Road. Originally meant for pleasure drives to the country it now serves as a major route to Westchester and New York City. Formerly the Town of Frederick, Kent is also known as Kent Lakes because it holds the many lakes which serve as reservoirs for New York City. Kent embodies the communities and hamlets of Allen Corners, Berkshire Terrace, Carmel Park Estates, Farmers Mills, Gypsy Trail, Lake Carmel, Kent Cliffs, Kent Corners, Kent Hills, Luddingtonville, Meads Corners, Richardsville and Yale Corners, totaling about 15,000 people. 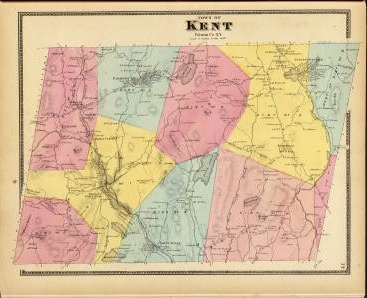 Kent is 52 miles from NYC and 25 miles from Danbury Connecticut. Kent Lakes is also home to several New York City Reservoirs, among them Boyd's Corners and West Branch, with the former being the east of Hudson - terminus of the Catskill/Delaware system - and a vastly important link in what may be the world's most important engineering feat - the New York City water supply. Kent Lakes is home to two State Parks - Wonder Lake in the east and Fahnestock in the west. In addition, the Town of Kent maintains several parks, one of about 100 acres on Farmer's Mills Road, another on the edge of the Lake Carmel community and a third park on Horse Pound Road, courtesy of the New York City Department of Environmental Protection. 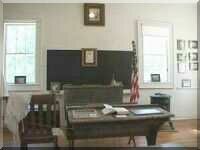 Putnam County has a county park, a fireman's training school and 4H Fairgrounds on Gipsy Trail Road within our town. There are four New York State Department of Environmental Conservation Multiple Use Areas in Kent (Pudding Street, California Hill, Big Buck and White Pond) and the Mount Nimham State Forest occupies more than 1000 acres in the heart of this beautiful place. At the top of Mount Nimham is New York State's tallest remaining fire tower (90') which has recently been restored. Views from its cabin encompass 75 miles in all directions - from the Empire State Building in the south - the Catskills to the northwest and the Berkshires in the northeast. The area where the Town of Kent now sits was once home to the Wappinger Indians before the Europeans came to these shores. Daniel Nimham, (1724-1778) was the last chief of the Wappingers and was the most prominent Native American of his time in the Hudson Valley. The Wappingers were descended from ancestors who had been forced to part with their best lands during the preceding century, and who roamed the hills and valleys of Putnam and Dutchess Counties. Chief Nimham learned to speak English and used his multicultural skills to defend his people’s rights in the courts of London and New York. When betrayed by the British Crown, he joined the rebel army and found common cause with colonists struggling to free themselves from royal authority. Daniel Nimham and scores of his fellow Wappinger fought for the American cause during the Revolution. They served with George Washington at Valley Forge and later with General Marquis de Lafayette's troops. Unfortunately, all hope for fairer treatment under the Americans, ended in August of 1778 when Daniel Nimham and 50 of his fellow Wappinger were killed by Loyalist and British Dragoons in a battle on Cortlandt Ridge in the Bronx. A monument to his sacrifice marks the spot and the field of battle remains intact. It is said that once each year during his life Daniel Nimham would stand on the very Mountain given his name, and claim the mountains and valleys we see today as the land of his people. This area was also once part of the Phillipse Patent granted in 1679 and local deeds still claim mineral rights for that family. This town, which at one time also contained Patterson, Carmel and Southeast was called Frederickstown Precinct and was formed on March 24, 1772. 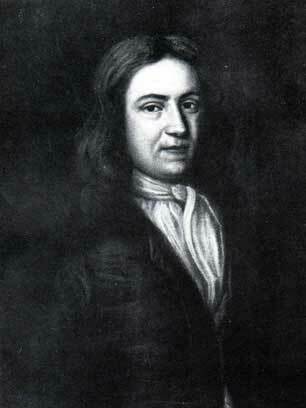 The first settlement, however, was made about 1750, by Zachariah Merritt. Other early family names were Boyd, Wixon, Farrington, Burton, Carter, Barrett and Ludington and they can still be found today. And, until 1812 was part of Dutchess County. The present day intersection of I84 and Ludingtonville Road was the home of Col. Henry Ludington and his daughter Sybil, who rode 40 miles one dark night to call up her father's militia during our fight for Independence. Where Paul Revere was captured and failed at his mission Sybil, then just 16 years old, succeeded. In honor of this brave woman and her father we now know that location as Ludingtonville and a statue of her stands on the shores of Lake Gleneida across from our County Courthouse. She is now universally known as the female Paul Revere. 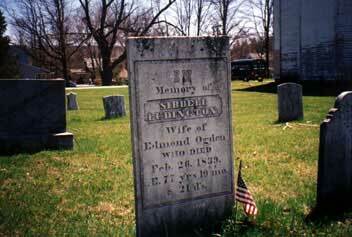 Sixteen year old Sybil Ludington was a typical girl in 1777. While putting her younger brothers and sisters to bed on the night of April 26, 1777, word reached her house that the British, under General William Tyron, were burning the town of Danbury, Connecticut, 25 miles away and destroying major stockpiles of the patriot militias that were stored there. Sybil convinced her father to let her summon her father's militia. She rode her horse Star on 40 miles of country roads in the dark. Her course took her down through Carmel, on to Mahopac, and around to Kent Cliffs, to Hortontown, through Farmers Mills to Stormville and then back home again. Kent was a man of great purity of character and of singular simplicity and guilelessness. He died in New York on the 12th of December 1847. To Kent we owe several works, including a Commentary on International Law James Kent was born at Philippi in New York State on the 31st of July 1763. He graduated at Yale College in 1781, and began to practice law at Poughkeepsie, in 1785 as an attorney, and in 1787 at the bar. 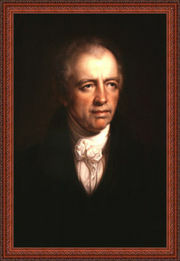 In 1791 and 1792-93 Kent was a representative of Dutchess county in the state Assembly. In 1793 he moved to New York, where Governor Jay, to whom the young lawyer's Federalist sympathies were a strong recommendation, appointed him a master in chancery for the city. He was professor of law in Columbia College in 1793-98 and again served in the Assembly in 1796-97. In 1797 he became recorder of New York, in 1798 judge of the supreme court of the state, in 1804 chief justice, and in 1814 chancellor of New York. In 1822 he became a member of the convention to revise the state constitution. Next year, Chancellor Kent resigned his office and was re-elected to his former chair. Out of the lectures he now delivered grew the Commentaries on American Law (4 vols., 1826-1830), which by their learning, range and lucidity of style won for him a high and permanent place in the estimation of both English and American jurists. Kent rendered most essential service to American jurisprudence while serving as chancellor. Chancery law had been very unpopular during the colonial period, and had received little development, and no decisions had been published . His judgments of this class cover a wide range of topics, and are so thoroughly considered and developed as unquestionably to form the basis of American equity jurisprudence. 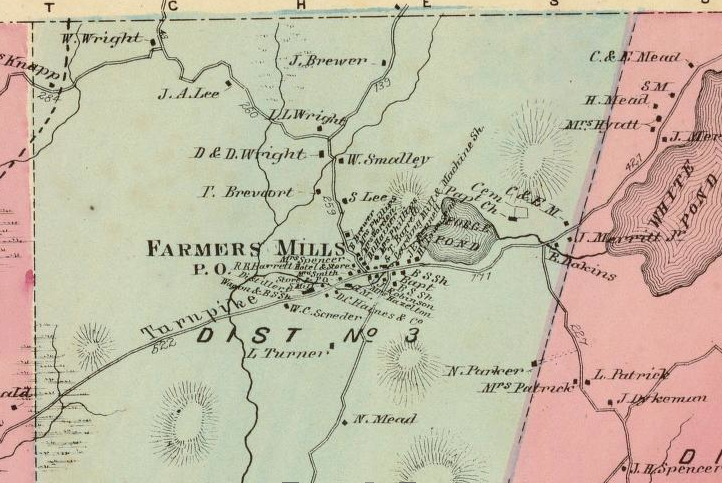 Sitting at an important junction on the Phillipstown Pike was the village of Farmer's Mills. Water was used from White Pond as a source of energy to make this hamlet one of the most important inland towns in the region. It was a central point for processing and milling the abundant grain from farms in the area and as far away as Litchfield, Connecticut. Grains gathered from farmers to our west were processed, ground and packaged for shipment through Cold Spring. It was not until the railroad came to Brewster, along with the creation of the Boyd's Corners Reservoir that Farmer's Mills fell into decline. All that is left of this town today is the sluice from White Pond, a one room schoolhouse, some cemeteries and old foundations one might find while hiking in our woods. When the Half Moon anchored in the Hudson in 1609, the area on the east bank was inhabited by a band of Native Americans called the Wappingers, sometimes known as the "River Indians". This group of Munsee-speaking Delawares farmed in the valleys, hunted in the forests and swamps, and gathered shellfish in the Hudson estuary in the land that would become Putnam County. No European settlements are known to have occurred here during the 17th century, but the Wappingers had regular contact with Dutch traders from whom they acquired trade goods in return for beaver pelts. They also acquired disease, alcohol, and firearms, decimating their people. In 1691, two Dutch traders purchased a portion what would become Putnam County from the Wappingers for a "competent" sum of money. Six years later, the traders sold it to Adolph Philipse, a wealthy merchant, who then obtained a royal patent for land extending all the way from the Hudson to the Connecticut border, an area to be known as the Philipse Patent. In 1737, the Colonial Assembly designated the Philipse Patent as the South Precinct of Dutchess County, and the Philipses began leasing farms to immigrants from Massachusetts, Connecticut, Long Island and lower Westchester. After Adolph Philipse's death, the Patent was divided in 1754 into nine lots granted to three heirs, Mary Philipse, Philip Philipse, and Susannah Philipse Robinson. During the French and Indian War, many of the Wappingers went to Stockbridge, Massachusetts. (Thereafter, they were often known as Stockbridge Indians or Stockbridge Mahicans.) When the Wappingers returned to Putnam after the war and attempted to regain the land that the Philipses had been leasing to others, they brought suit. Their sachem Daniel Nimham argued with considerable justification that they had been defrauded of their lands, the Provincial Council, dominated by great families like the Philipses, upheld the Philipse claims. During the Revolutionary War, the control of the Hudson Highlands was critical to both sides. British strategy aimed to dominate the Hudson, Lake George, and Lake Champlain corridor and so cut the colonies in two. To do this, the British had to take the east (Putnam) or west bank of the river and to break through the iron chain laid across the river. The British managed this once but failed to maintain their advantage. For part of the Revolution, the defenders of the Highlands were commanded by General Israel Putnam, for whom the county would be named. 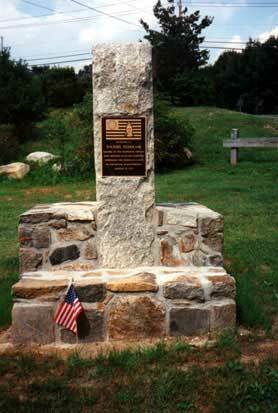 Putnam was also the scene of two other fascinating Revolutionary War events. Benedict Arnold was staying in Putnam, across from the West Point fortifications that he intended to place in enemy hands, when his treachery was discovered. Arnold's flight from Putnam is marked by a historic marker. 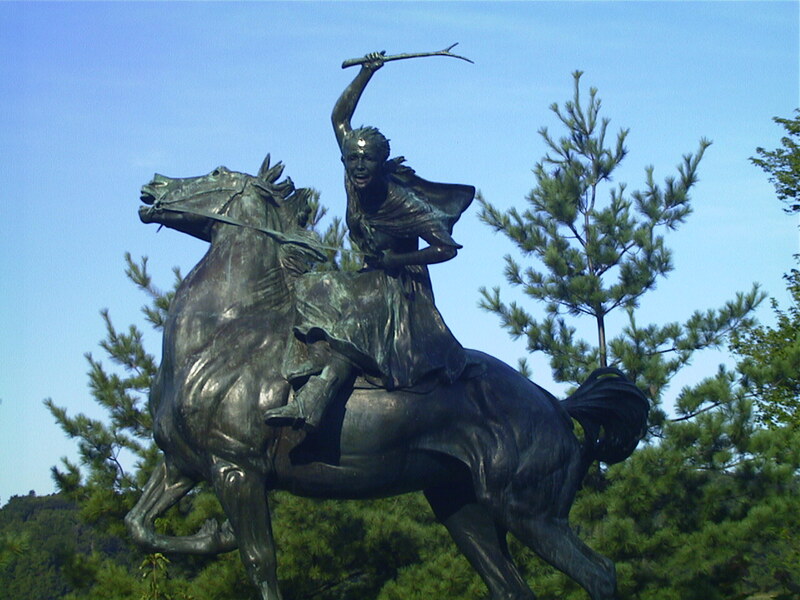 A statue and many other markers commemorate the extraordinary, night-long ride of Sybil Ludington, which rivaled that of Paul Revere. In April of 1777, the 16-year-old daughter of Colonel Henry Ludington roused the area militia under her father's command to march to Connecticut where British troops were burning Ridgefield and Danbury. The militia succeeded in driving the British back to their ships lying in Long Island Sound. Although there is no contemporary documentation of the event, Sybil's feat is firmly established in local and family tradition . 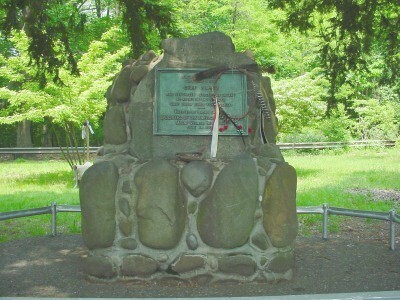 The sachem Daniel Nimham and the Wappingers supported the American cause during the Revolutionary War, and many of them - including Nimham and his son - were killed at the Battle of Kings Bridge in 1778. Nevertheless, when the lands of the Philipses were granted to other patriots, the Wappingers received no reward for their valor. Most left the area and settled eventually in Wisconsin and Ontario. Because the Philipses had been Loyalists during the war, most of their lands were confiscated and sold by Commissioners of Forfeitures primarily to those Philipse tenants who had backed the winning side. The flight of the Philipses and other Tory families created opportunities for New Englanders and others looking for vacant land, creating an influx of immigrants to the County. By 1812, the increased population of southern Dutchess County as well as the inconvenient distance to the county seat in Poughkeepsie caused the State Legislature to create the new County of Putnam, which would have its own Board of Supervisors, courthouse and jail. Putnam's position on the Hudson gave it a good, cheap means of transporting people and goods to New York City and Albany, but the river froze in the winter and, of course, did not provide for inland travel. In 1815, the Philipstown Turnpike Company was organized to improve a toll road from Cold Spring to Connecticut. Wagons on the turnpike brought manufactures to the interior and carried farm produce from eastern Putnam and iron ore from the mines in the Highlands to the river. Unfortunately, the tolls were not adequate to make it a profitable venture for the investors. 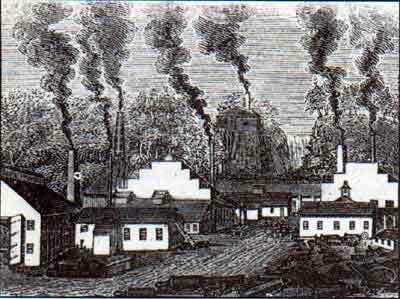 Two years later, Putnam's most famous industry, the West Point Foundry, was born. The events of the War of 1812 impelled the Federal Government to encourage a domestic munitions industry. Cold Spring's location on the Hudson opposite West Point was ideal: it had river transportation, water power, iron ore from nearby mines, and fuel from the charcoal making in forests close at hand. The Foundry's huge demand for workers, skilled and unskilled, brought Putnam's first flood of immigrants directly from Europe, primarily from England and Ireland. By the mid-19th century, two railroads from New York City were operating in Putnam County - one tracking the level shore of the Hudson to Cold Spring and the other in the Harlem Valley to Brewster's Station. Gail Borden built his new milk processing plant in Brewster where he could ship his condensed milk to market by rail. His operation required nearly 90,000 quarts of milk each day from the farmers in eastern Putnam County. Transportation of raw milk to Brewster encouraged the development of a network of good roads in the area. 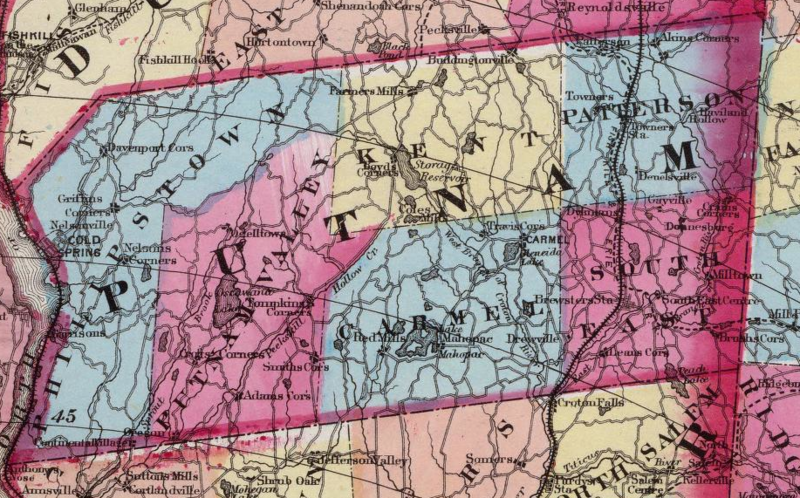 Although small, Putnam County played a significant role in the Civil War. About a third of the men and boys between 15 and 55 served in the military, and four distinguished fighting generals - as opposed to the "political generals"- are associated with Putnam. In addition to the ordnance supplied by the West Point Foundry and the condensed milk sold by Borden's, Putnam contributed to the cause by feeding the troops as well as civilians those at home. Declining sheep farming received a boost by a renewed demand for woolen clothing when southern cotton was unavailable. Agriculture was also in decline. New York City's need for more drinking water caused it to look to the entire Croton River watershed to supply its needs. Beginning with the construction of the Boyd's Dam in 1866 through the construction of the last reservoir in the County in 1906, some of Putnam's best arable land was inundated. The lure of western land was irresistible for farmers who had worn-out land or whose property was taken by the City. The population of the County declined precipitously; in 1920 there were fewer inhabitants here than in 1820! The abandonment of the mines and farms, the creation of the reservoirs, and the preservation of new open space all contributed to the scenic beauty of Putnam County and made it attractive to its new industry - "summer people". 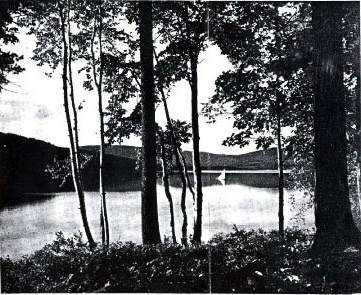 Hotels, inns, and boarding houses around Lake Mahopac, Oscawana, and the many other lakes attracted vacationers to Putnam County. The existing railroads and the Putnam Division of the Harlem Railroad, built in the 1880s, made Putnam a vacation mecca for New York City. In the early 20th century, improved roads brought a new sort of "summer people" to the County. The movement for better highways accelerated after the first World War. During the Great Depression, county planners succeeded in paving many of Putnam's dirt roads. The Taconic State Parkway reached Putnam County in 1931. Small bungalow colonies sprang up, and cheap vacant land was laid out in large developments of summer homes, like those in Lake Peekskill, Lake Carmel, and Putnam Lake. "A place in the country" was now accessible and affordable for many New York City residents. Putnam County's natural beauty made it a desirable summer resort area. 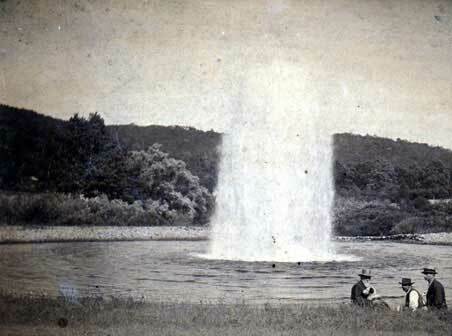 Its many lakes and reservoirs were attractive for fishing and water sports. The abandoned iron mines and farms in the northwestern part of the county reverted to nature and became the nucleus of forested Clarence Fahnestock State Park in 1929. While Putnam's population doubled during the summer months, the year-round population, which had reached an all-time low in 1920, began to grow. Apple, egg and poultry farming gradually replaced many of the dairy farms of the 19th century. Construction trades and the service industry were stimulated by the explosion of the summer population. People discovered that they could summer in Putnam County and still commute to New York City to work. 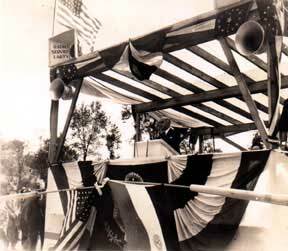 A new Putnam County was in the making on the eve of World War II.